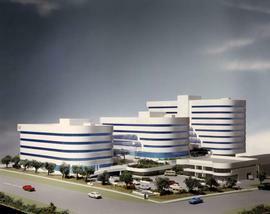 Architect's model for a commercial retail and office building. Three concrete and glass towers are linked by two glass atria rising from ground level to the third floor. Copy photographs of display window of an upholstery store. 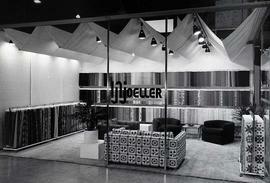 Copy photographs of interior and exterior views of a store. 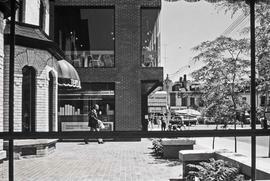 Copy photographs of exterior and interior views of a retail building. Street views of a converted church (retail stores). 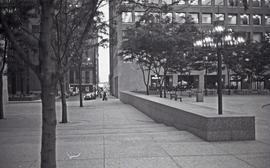 Exterior photographs of the Commerce Court courtyard, Toronto (at lunch time with crowds and at night). 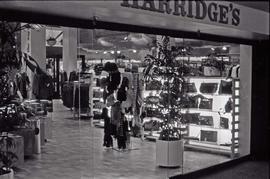 Interior photographs of a shopping centre including courtyard and stores. 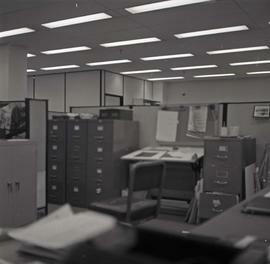 File contains transparencies featuring images of a customer being assisted by an employee at the counter of a Kodak memories image center, offering express film developing. Renovation and addition to a heritage property located at 2 Gloucester Street in Toronto. 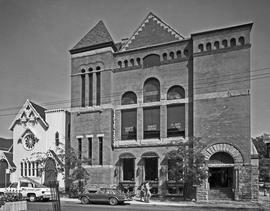 The original Masonic building was constructed in 1888. The addition to this building won a Canadian Architect Award of Excellence in 1972. Borderless print depicting the exterior of areal estate office and surrounding landscape. Building sign reads "Est 1908, R. Lamont & Co Real-Estate"
Photographs of the interior of Commerce Court, Toronto, including CIBC, Mappins Jewelry, lobby and other retail stores. Folder contains photographs of an IKEA located in Richmond, B.C.